An official ceremony has been held to honour 61 police dogs for their years of service. 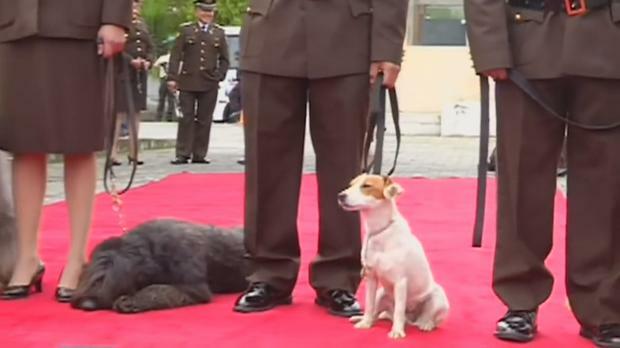 The dogs were awarded medals in recognition of their service with The National Police of Ecuador in Quito. Their service included preventing drug trafficking, keeping public order, attending public occasions, search and rescue of missing persons in a recent earthquake and dog therapy. The occasion also remembered seven canine partners who had died in the line of duty. "Saying each name is remembering stories, glorious experiences and successes that enrich the history of the National Police," said one Police Officer. The dogs - German shepherds, Labradors and Golden Retrievers - have been adopted and will spend the rest of their lives as family pets. Dean Gray Bolivian police say a bus crashed head-on with another vehicle and plunged down a deep ravine, killing at least 25 people and leaving 24 others injured yesterday. Independent.ie Newsdesk Heavy rains have unleashed a landslide in a remote mountain town in south-western Colombia, killing at least 17 people and injuring five more.